The USS Juneau (CL-119), lead ship of the Juneau class, a modified version of Atlanta class light cruisers, had three distinctions that set this single cruiser apart from the many other cruisers of the United States Navy (USN). First, USS Juneau was the first of the “last series” of Atlanta class anti-aircraft light cruisers (CL) built for the Navy; second, it was one of only two light cruisers to be modernized with new 3”/50 Mk.33 twin anti-aircraft mounts (the other being USS Manchester, CL-83) post-war; lastly, the only gun cruiser to engage in a surface battle with enemy ships during the Korean War (1950-53). 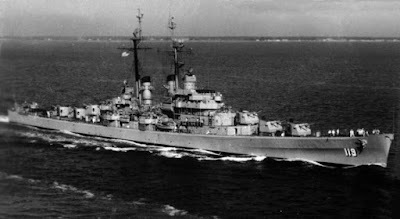 The cruise was initially designated CL-119, but changed to CLAA-119 on 18 March 1949, representative of the intended role of the class, as fleet anti-aircraft protection ships. Let's see her story! 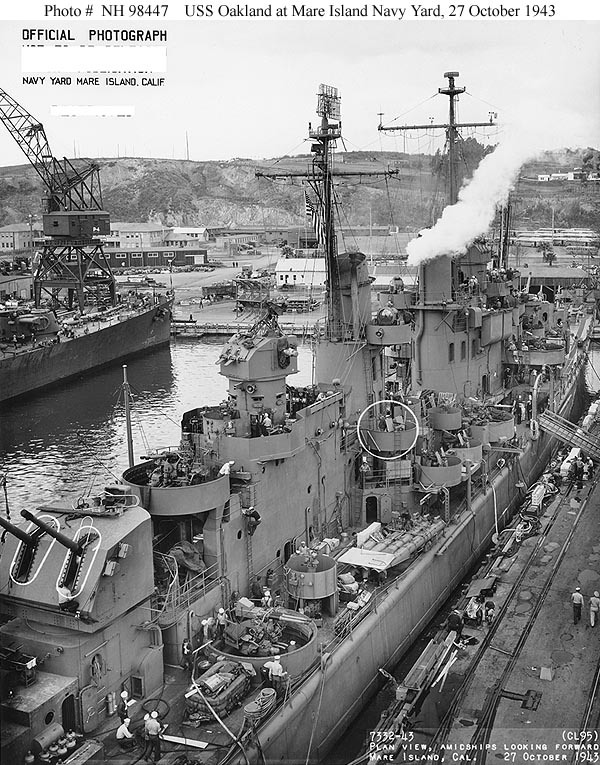 USS Juneau off the Mare Island Naval Shipyard, California, following overhaul, 11 Feb 1952. 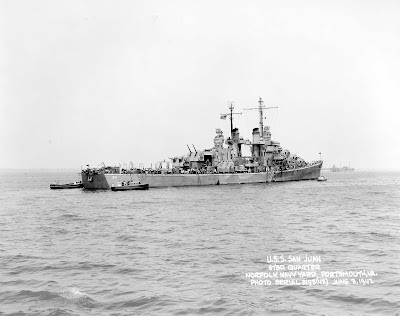 6 September 1941, in New Jersey. 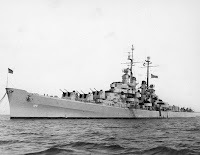 The original Atlanta class light cruiser (CL) had its origins in 1937-38, when the US Navy tasked the naval architect firm Gibbs & Cox, Inc. to develop new light cruiser alternative designs, intended to take advantage of the new 5”(127mm)/38cal twin and planned twin 6”/47cal dual-purpose gun turrets. These designs ranged in tonnage from 5,500 to 8,000-tons standard; preliminary design for the Atlanta class was completed in July 1938. 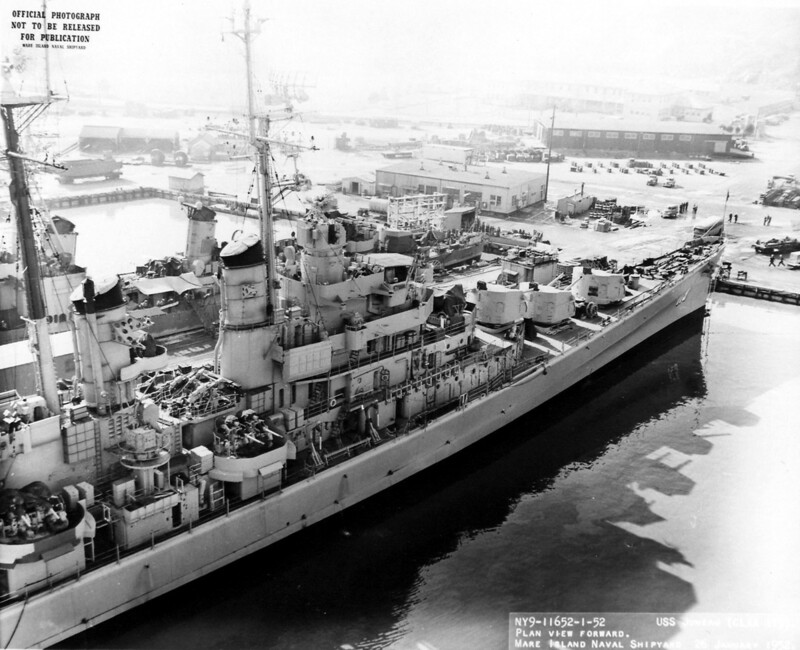 Original design requirements were exceeded, including 7,000 rounds of 5” ammunition. 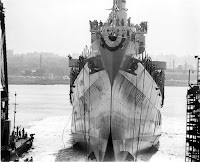 Hull was essentially similar on a smaller scale than the currently building Brooklyn class, retaining full transom aft. 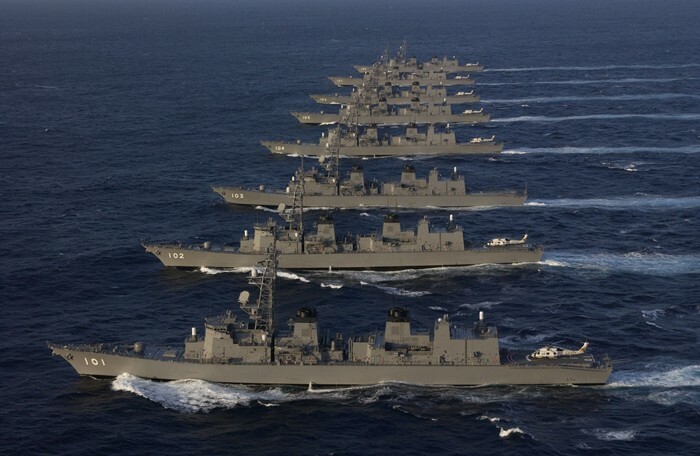 Based on size, armament, and other characteristics, they were viewed as “Flotilla Leaders” for a destroyer squadron (10 ships). 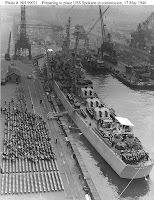 The first four (4) ships ordered, Atlanta, Juneau (I), San Diego and San Juan, were split between Federal Shipbuilding Co. (Kearney, NJ) and Bethlehem Shipyard (Quincy, MA), the former because of yard size, it was not able to build larger ship designs. All were ordered on 25 April 1939. The design consisted of many novel features, including the provision of an inner-bottom extending to the second deck and following the contour of the outer shell. The side armor was of watertight revetted construction forming part of the watertight envelope of the hull. 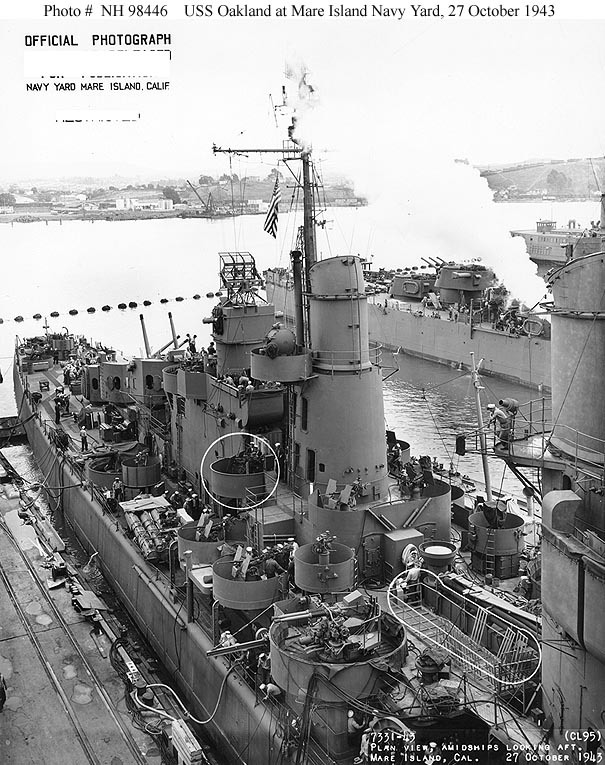 Armor protection was moderate, due to the weight limitation dictated by speed requirements, and consisted of side armor in way of the machinery spaces, bulkheads enclosing magazines, conning tower and steering engine room, with lighter protection on decks and on the boundaries off other vital areas. 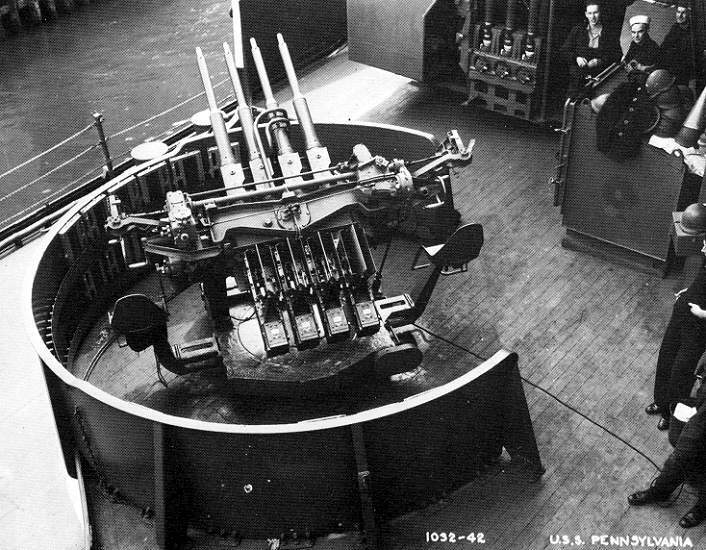 The propelling machinery was of improved design based on experience gained in the operation of destroyer machinery. Manufactured by Westinghouse Electric Corporation, each set of turbines consisted of one cruising, one high pressure and one double flow low pressure. 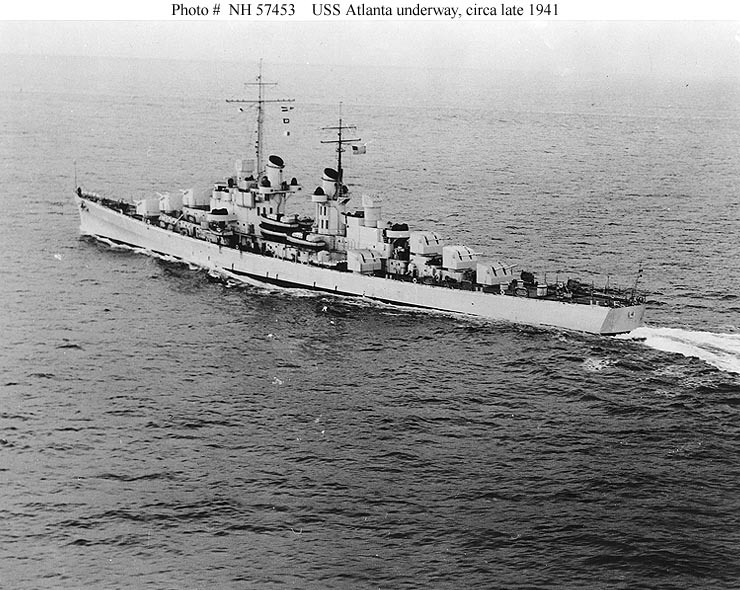 Fantail view of USS Atlanta during her sea trials. 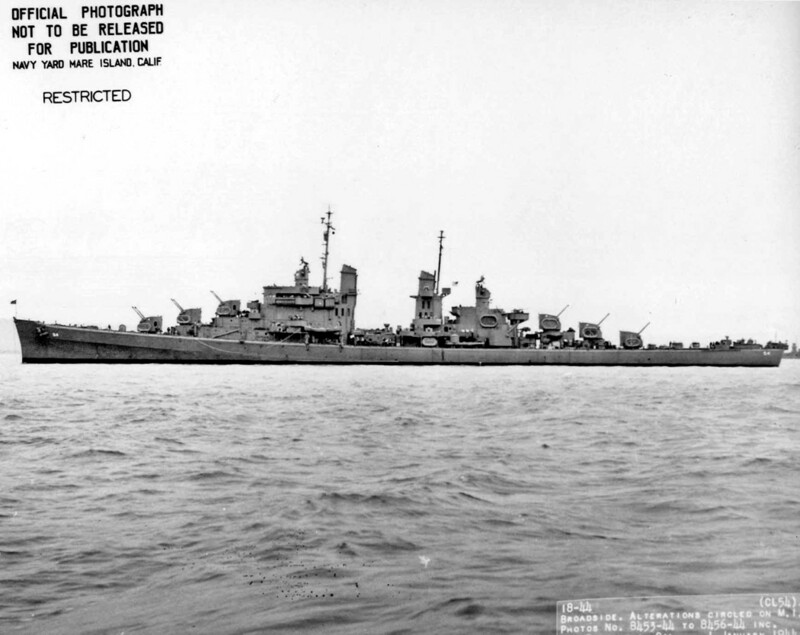 Note the depth charges. 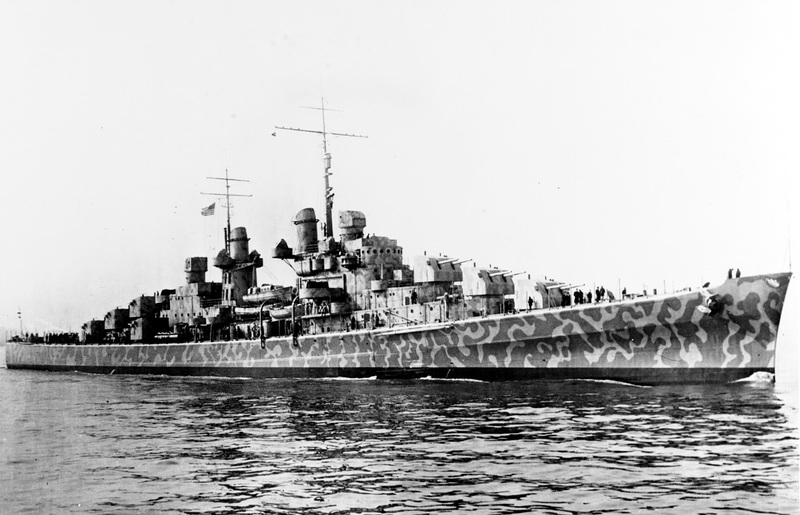 The differing designs of 1937-38 light cruisers varied in armor, depending heavily on the tonnage of the design. The Atlantas were fitted with 3.75-inch belt, beginning forward from the bridge and to the end of the aft Engine Room. 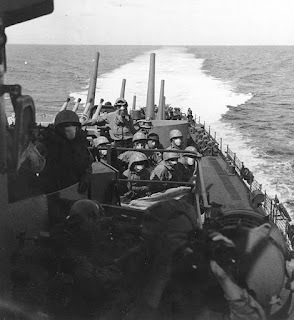 Bulkheads had a 3.75-inch thickness as well; and, a horizontal armored deck of 12.5-inch offered some protection against light bombs and shells. 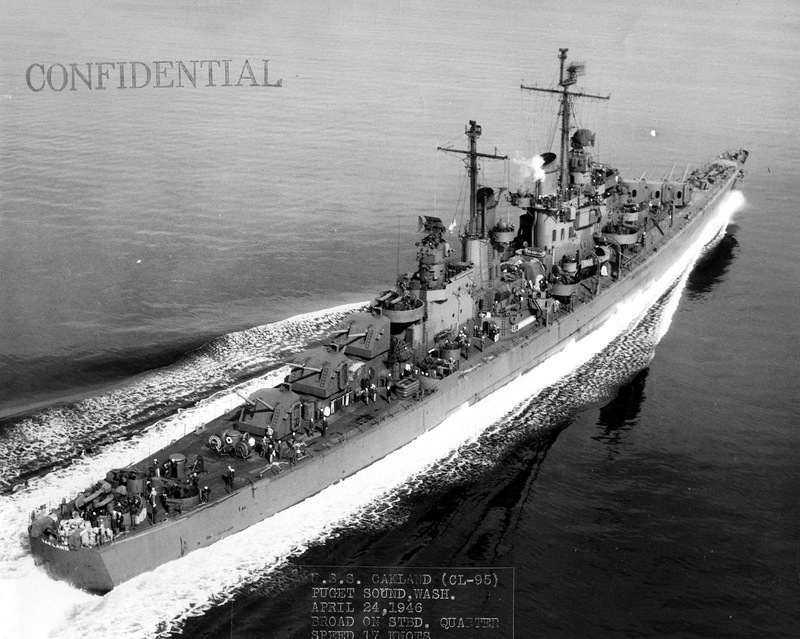 Total weight of protection was 585-tons, when the class was first built, but increased as splinter protection (0.75-in. 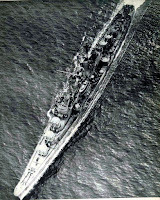 STS) increased during the second and third-series ships design. 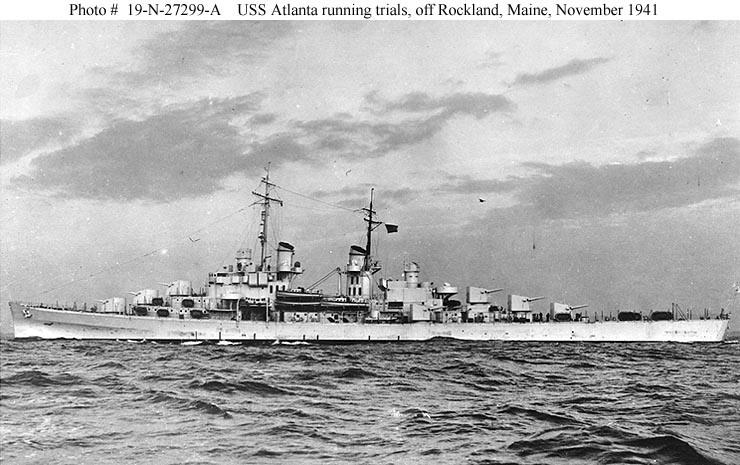 The second-series of four ships, Oakland class cruisers, consisting of Oakland, Reno, Flint, Tucson, were completed with 2.5-in. armor over fire control positions and had conning towers (CT) removed. The Atlantas were 165 meters long. 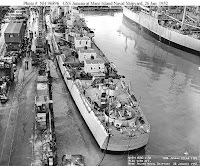 In normal condition, the hull weighed 2,555-tons (Hull Weight: ship hull, without armament, protection, machinery, equipment and outfitting) with Light Ship (Light Ship: Sum total of hull, armament, machinery, protection, equipment and outfitting) displacement at 5,730-ton, ammunition an added 338-ton and ships stores & provision another 295-tons; with all other weight, a total of 6,592-tons. 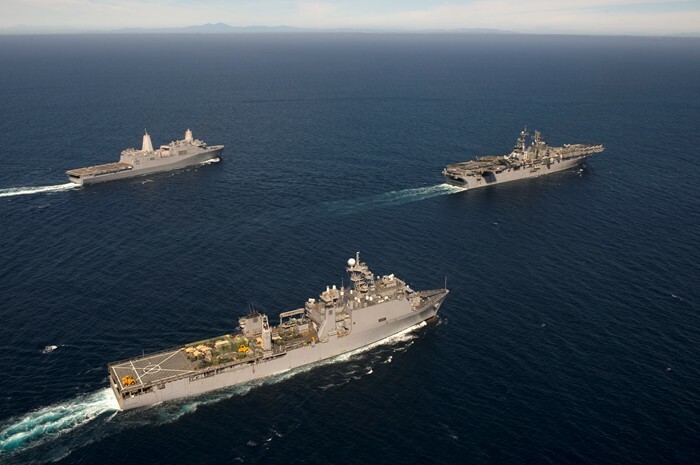 Fuel added 943 NFO (Navy Fuel Oil) and 46.7-tons of diesel (mixed with NFO), for total displacement of 7,671-tons - fully ready for war! 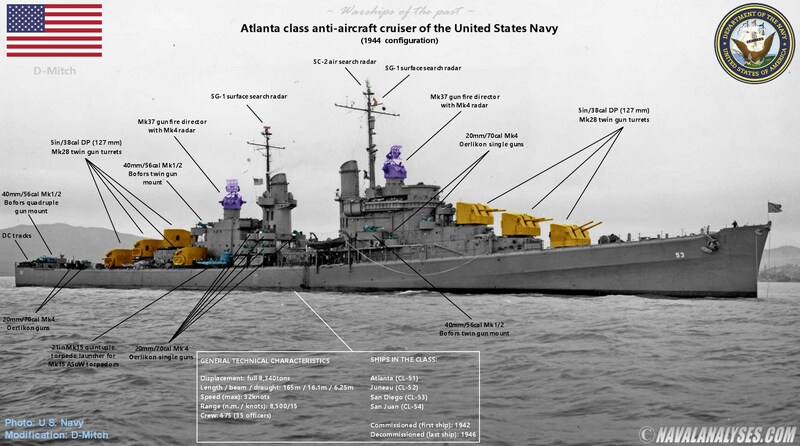 As built, the first-generation Atlanta class had 16 x 5”/38 twin (5”/38 was proved the finest dual purpose gun of World War II), 16 x 1.1” quad, and 6 x 20mm single AA guns. The twin 5”/38 Mk.28 HA mounts were electric driven through hydraulic gear, elevated by arc’s and pinions on a common shaft. Nominal rate of fire - with a good gun crew - was about 15-rounds per minute (per cannon), with range of 16,640-meters at 45-degree elevation; max elevation being 85-degree (compare this with then British AA gun elections of 35-40-deg. maximum. Fire control was via two Mk.37 located on the centerline atop the superstructure - at that time, the finest anti-air fire control system in the world. 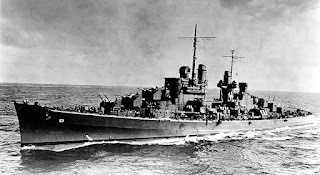 The Atlanta class cruisers were the only class of U.S. Navy cruisers commissioned during World War II to be armed with torpedo tubes, with eight 21-inch (533 mm) torpedo tubes in two quad launchers for Mk.15 torpedoes (5,500-meters at 45-knots). 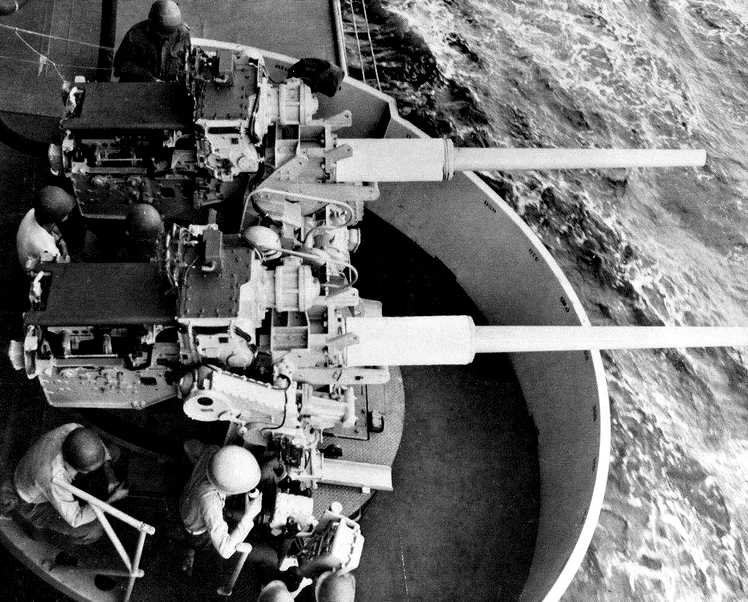 The second group, the Oakland class, was commissioned with only six twin 5”/38 mounts mounted in three superfiring sets of two-gun turrets fore and three more aft, and with “Bofors” 40mm guns from the start, with four additional twin 40mm mounts compared to their predecessors: two displacing the former 5”/38 wing turrets (improving both stability and close-range AA firepower while easing congestion) and two between the funnels displacing the previous two pairs of 20 mm Oerlikons. In addition the battery of 20 mm anti-aircraft cannons was increased with a pair on the bow, four (4) on the forward superstructure, eight (8) amidships arrayed either side of the aft funnel and two on the quarterdeck aft for a total of 16.
and depth charges on "K-gun" throwers by the main deck edge. Their classification may have been cruisers, but they retained some characteristics similar to other large destroyers, and they were expected to operate cohesively with destroyers. 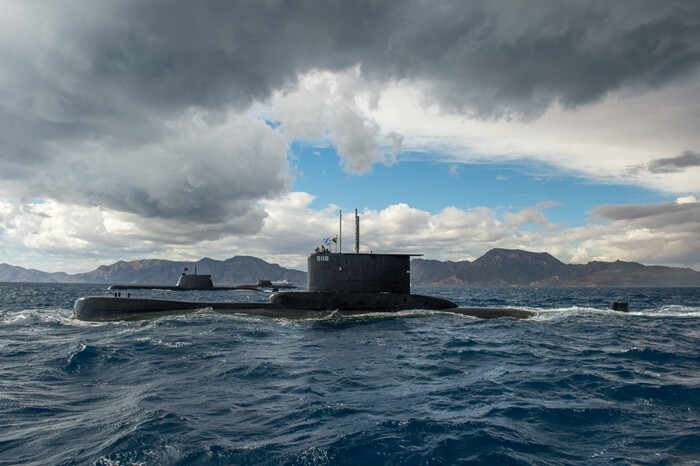 That demanded anti-submarine warfare (ASW) capability. 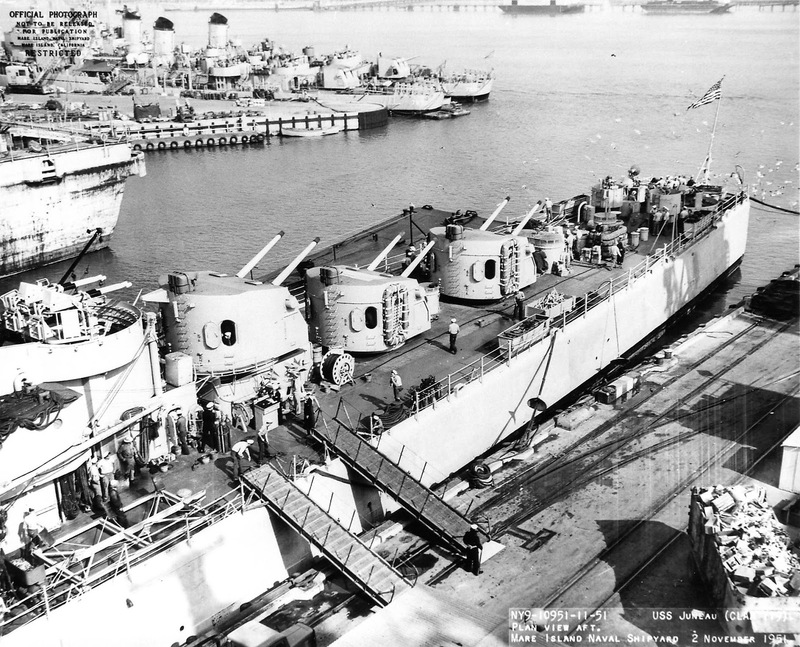 Initial fitting was two removable depth-charge (DC) tracks (five each, for the large 600-lb. depth charge). After commissioning, six DC throwers were added (30-lb. charges each). The latter were eliminated beginning in Mach 1943, when anti-aircraft weapons were added in their positions. 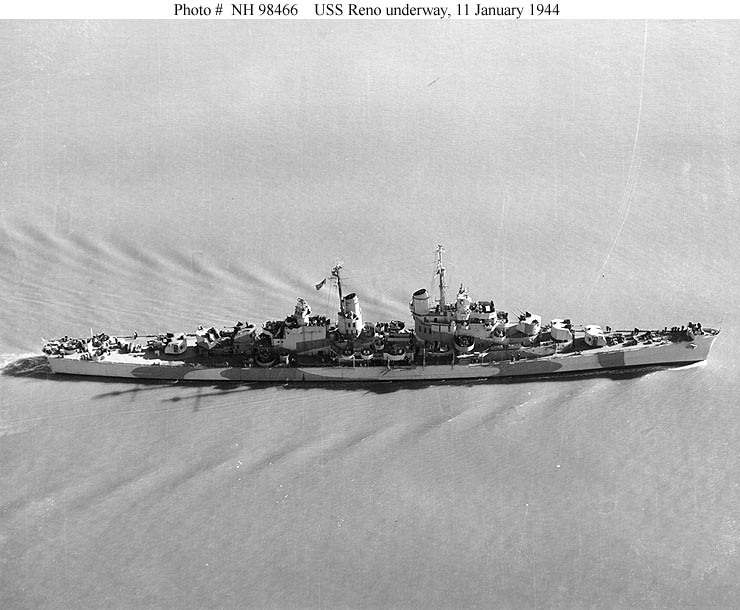 The sonar was retain, however (the same unit as on Benson/Livermore class destroyers). 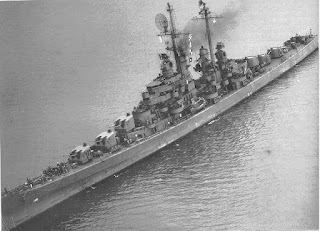 Modified photo of USS San Diego class anti-aircraft cruiser, in 1944. For a high resolution image click here. The original design had a range of 7,530-miles at cruising 15-knots. 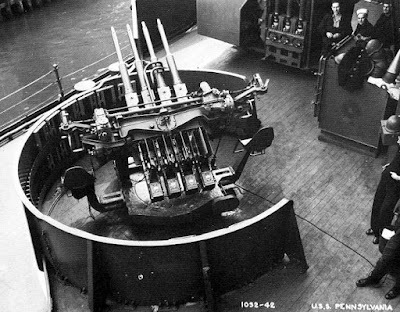 The engineering plant was guilt by Westinghouse Electric, each Geared Turbine set consisting of one cruising, one high-pressure and one double-flow low-pressure, driving two screws; the four boilers were Babcock & Wilson, with design 75,000-shaft horsepower (SHP), with trials demonstrating a speed of 33.67-knots. Due to added weight, late-war max speed was closer to 31.5-knots. 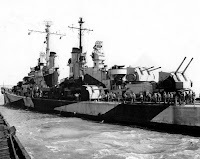 giving them the heaviest AAA broadside of any USN warship of World War II. 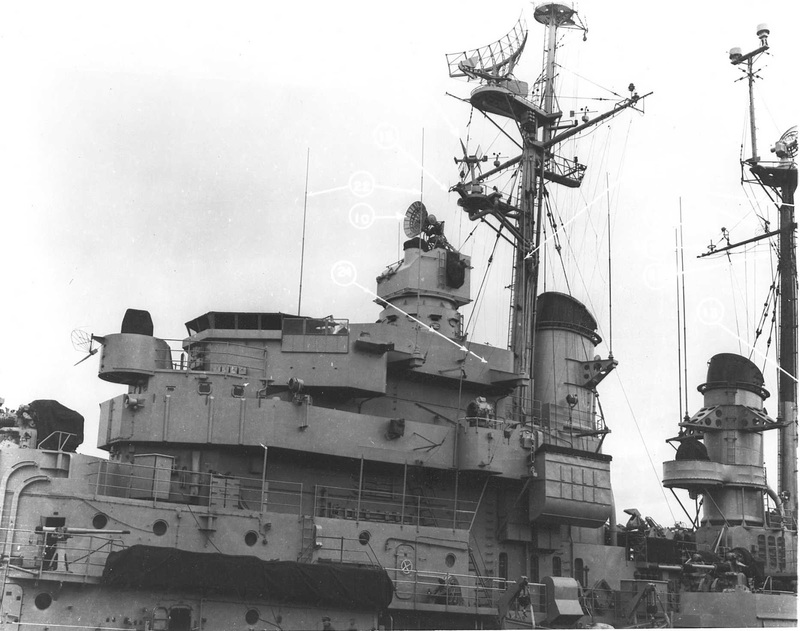 The “two stack” arrangement retained by all the Atlantas remained common to the late-war designs, until Fargo, and Oregon City, and Newport News classes. Each of the Engineering Rooms was located aft of each stack. 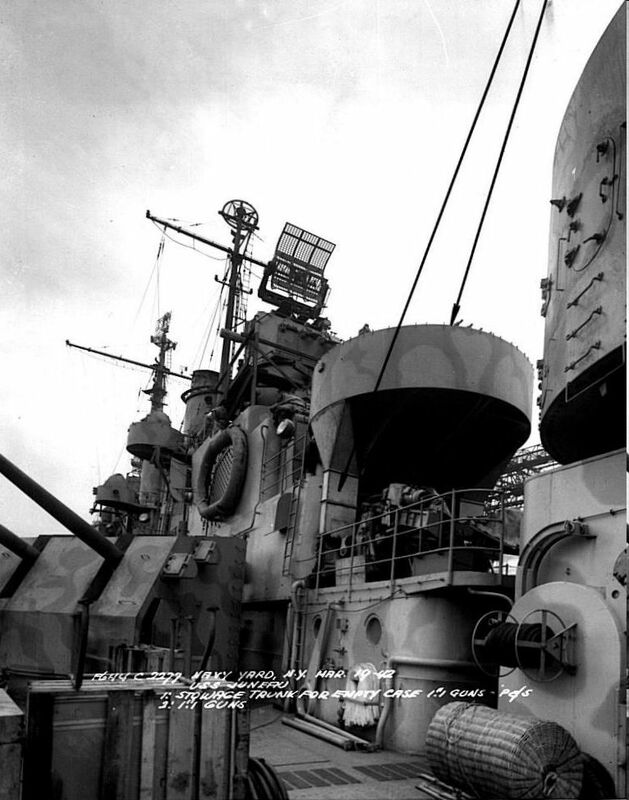 As with other U.S. cruiser designs, each of the 5”/38 twin mounts had a Handling Room located just below the deck of the gun mount, with a Shell/Powder Magazine located at the lower extremity of the hull (4th deck down from the A and Z-mounts in Atlantas), with the shell hoist extending upward from the Shell Magazine to each mount. These were all manually loaded on the hoist, and removed from it at the Handling Room. 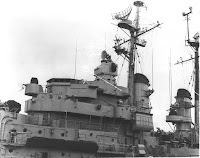 The ships Pilot House was co-located as an extension of the command bridge; aft of the bridge (two compartments) was the CIC room (almost directly below the Mk.37 forward FC director). Below CIC was the central Radio Room. 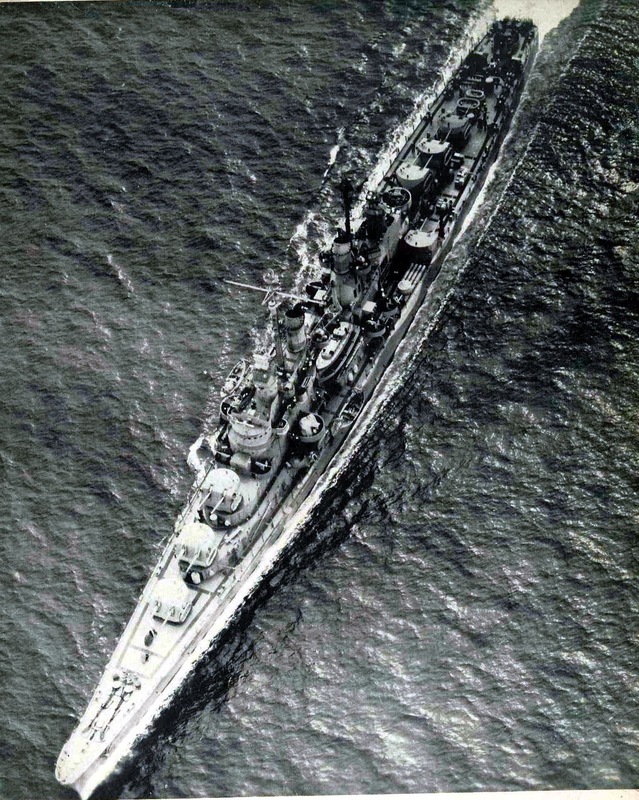 The Engineering Room was located aft of X-turret, three decks below. 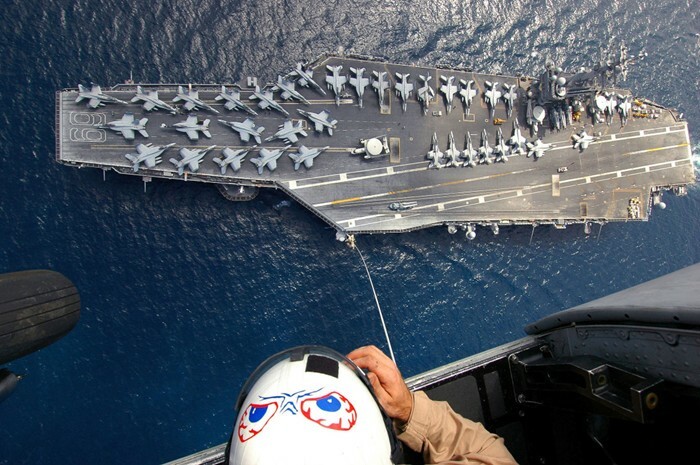 Crew berthing was one or two decks below the 5” mounts. 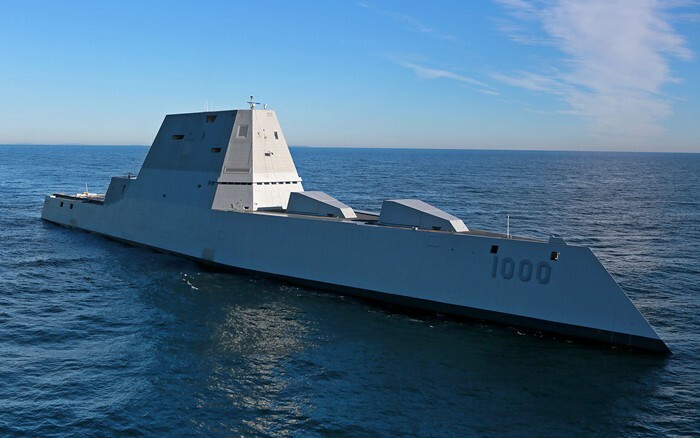 This put the crew in close proximity to the 5” Handling Shell/Powder Room(s) and mounts - for rapid “All Hands, Man Your Battle Stations” events! 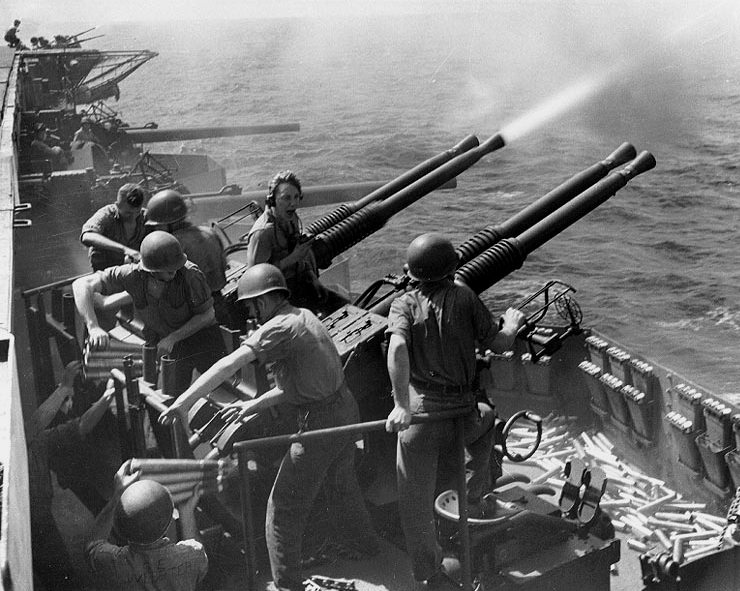 As the war progressed, the highly ineffective 1.1” AA guns would be replaced by 40mm/60cal. twin and quad mounts. In general, the armament among the ships varied. Further armor and other improvements added more weight as the war progressed, and final secondary gun numbers varied with each stateside overhaul. The Atlantas were thereafter overloaded with weight, compared to the size of their hulls, and throughout World War II and the postwar years, they had problems with topside weight which was addressed by a redesign of the third repeat order which was called the Juneau class cruiser. 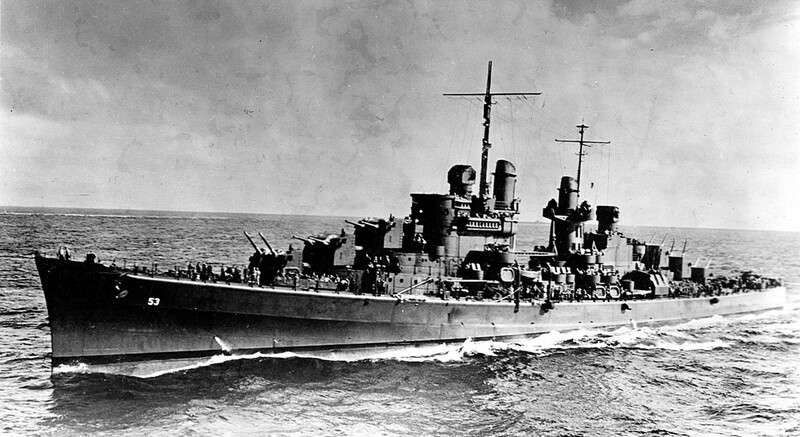 The only two cruisers of the class that engaged in surface combat were sunk: Atlanta and Juneau. 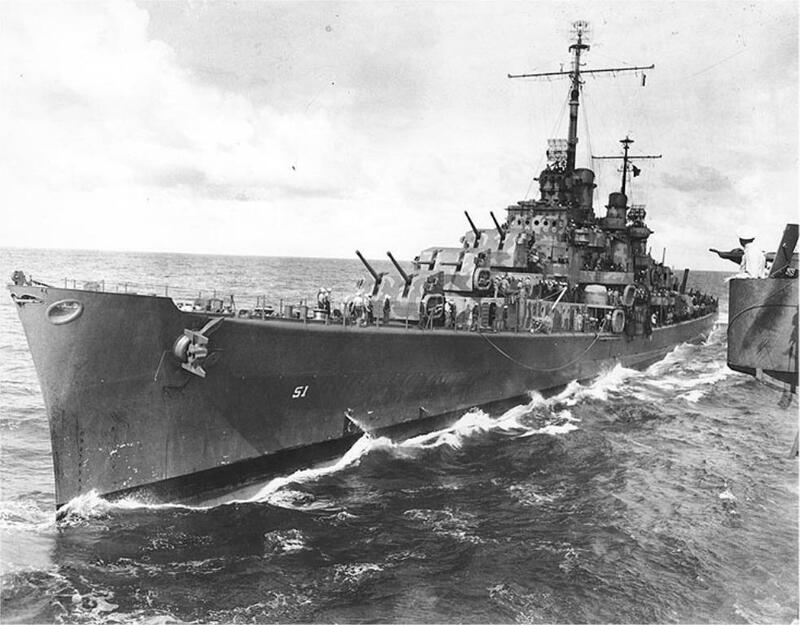 Both were sunk in surface combat at the Naval Battle of Guadalcanal. 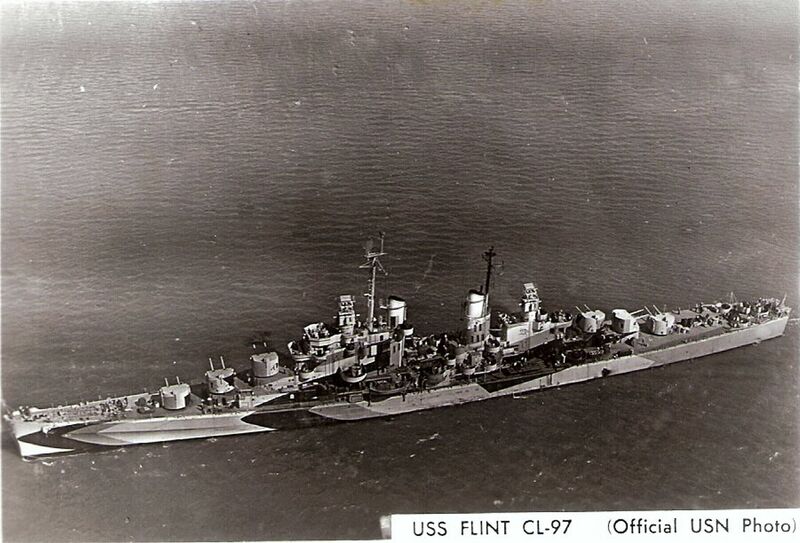 The other six were decommissioned shortly after the war and were scrapped in the 1960s. Dept charges racks and guns. When Juneau (II) was built, the major design changes of 1944 would include elimination of the two twin 5” wing mounts of the ‘Atlanta’ class in order to reduce topweight, as well as the torpedo tubes and anti-submarine depth charge tracks, adding two more quad 40mm and two twin 20mm AA mounts to the design, and twin 20mm replaced earlier single 20mm mounts. 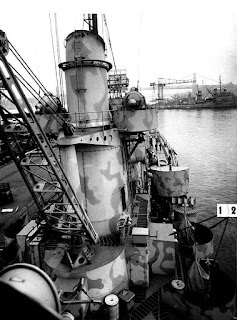 Another important change was the lowering of the n.2 and n.5 gun turrets to main deck level, with only turrets n.3 and n.4 superfiring, thus all the main gun mounts were on two levels instead of three for better stability. The same layout was followed by their successor, Worcester class. 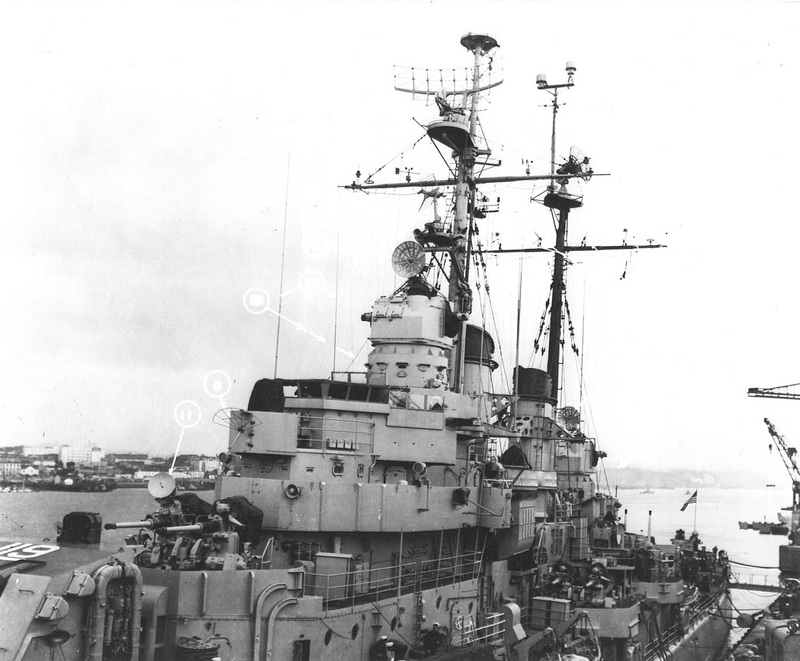 The radar suite now included a single SK-2 and SG-6 on the foremast, an SP for fighter-direction duties on mainmast, and TDY radar jammer, all fitted on heavier masts to meet the growing demand for electronics. 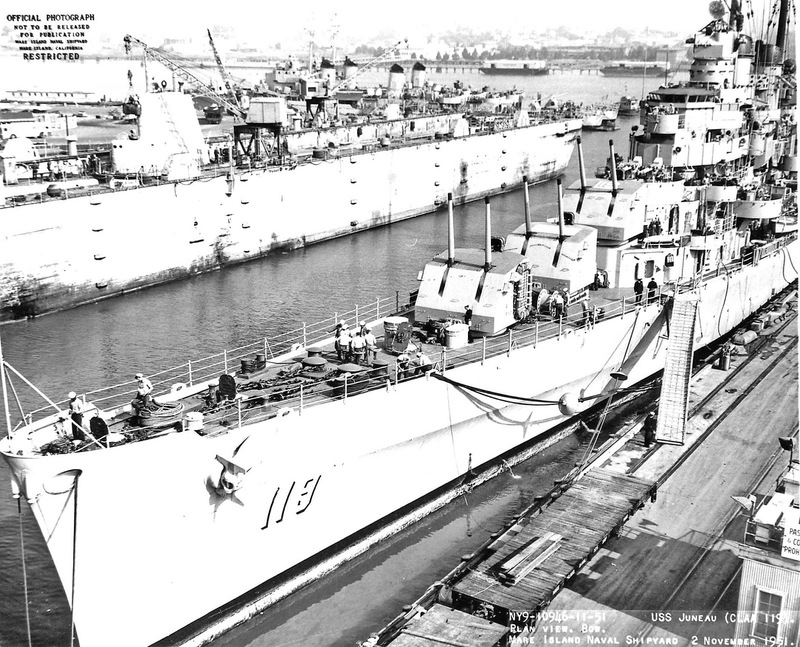 Two more ships were built in the new class, Spokane (CL-120) and Fresno (CL-121). 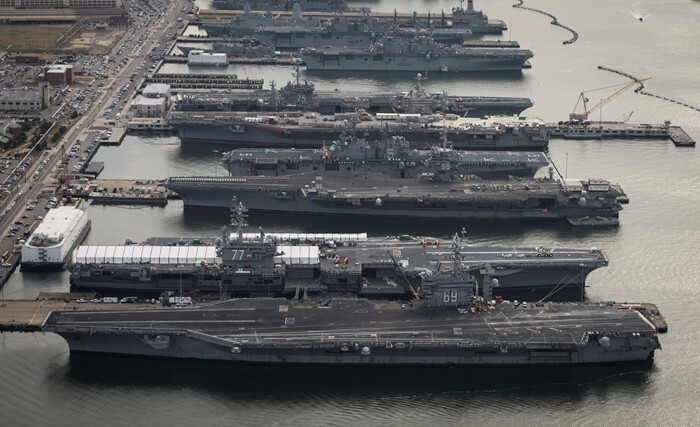 None of the ships served during World War II. 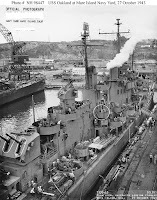 USS Juneau (CL-119) also differed from the earlier two-series Atlanta’s in way other than armament, including high fuel capacity (1,419-tons), standard displacement of 6,706-tons, and war load displacement of 8,470-tons. Fuel oil had increased to 1,450-tons. Endurance was now calculated at 6,440-n. miles at 20-knots. 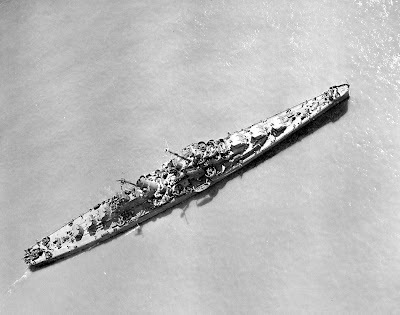 CL-119 was also fitted initially with 12 x 5”/38 Mk29 twin mounts disposed in equal numbers fore and aft of the superstructure on the centreline (similarly to Oaklands), a raised secondary to 32 x 40mm/60 (6 x quad, 4 x twin) and eight 20mm twin (16-total) AA mounts. 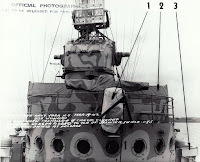 Armor on the 5” mounts was 32mm (1.25-in). 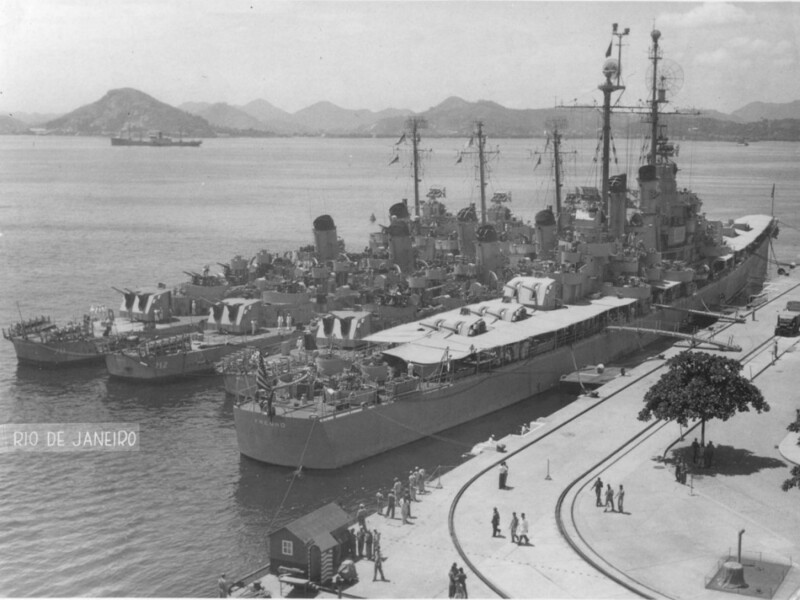 USS Fresno (CL-121) starboard side to, Rio de Janiero, Brazil, 10 Mar 1947. 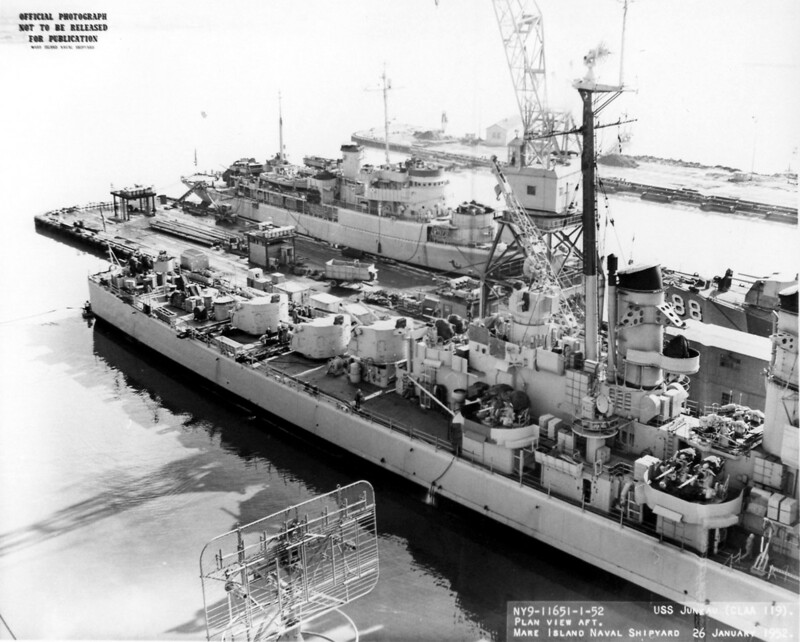 Tied alongside (from inboard) USS Gearing (DD 710), USS Gyatt (DD 712), USS Eugene A. Greene (DD 711). Four local Mk.57 and ten (10) Mk.51 anti-air fire control units had also been added. Complement has also risen to 47 officers and 695 ratings. The Juneau class had the same length as her predecessors. 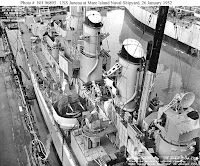 The wartime experiences also demanded removal of unnecessary equipment that might have been retained in peacetime; thus off went the boat cranes and ships boats that had been stored amidships! These were no longer necessary, as anchorages and atolls now routinely provided ship-to-shore boat services, as WW 2 advanced across the Pacific. 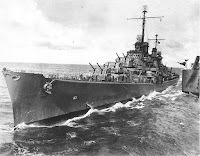 As the war progressed, the Navy increasingly favored the larger Cleveland class light cruiser for carrier and fast-battleship protection, as the larger cruiser design offered better cruising stability and the necessary speed to keep stations with the new BB’s and CV’s. 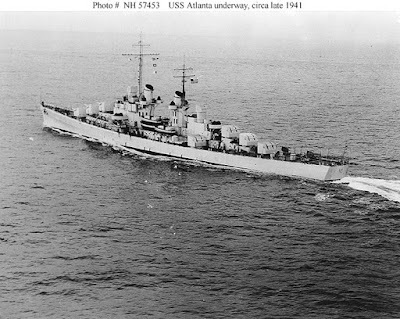 The Atlantas always had a level of natural vibration at medium-speeds (20-24-knots) in the command spaces, as well as gunner complained of vibrations aft - little surprise with an engineering plant that could put out 75,000-SHP. 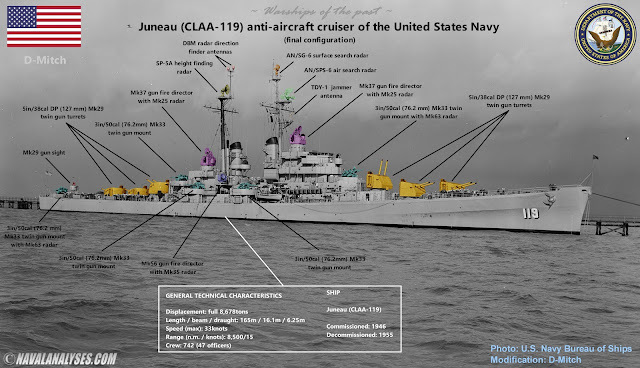 Modified photo of USS Juneau class anti-aircraft cruiser, in 1952. For a high resolution image click here. Second ship of the last series, USS Juneau (II) was laid down on 5 Sep 1944, launched on 15 July 1945, and commissioned on 15 February 1946, under the command of Capt. Rufus E. Rose. 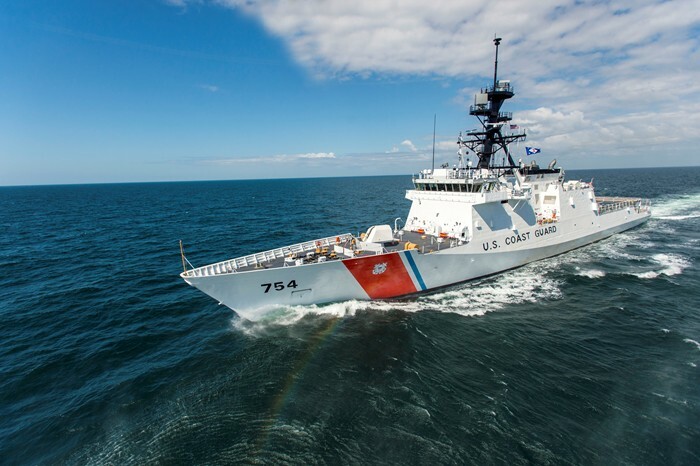 Juneau spent her first year of commissioned service in operations along the Atlantic seaboard and Caribbean. 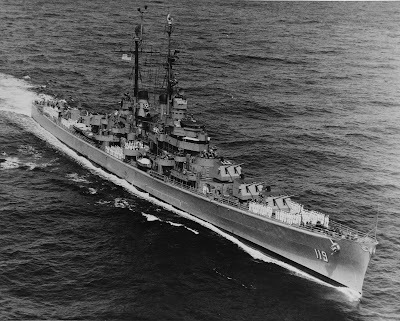 Prior to the Korean War, she deployed three times in the Mediterranean. 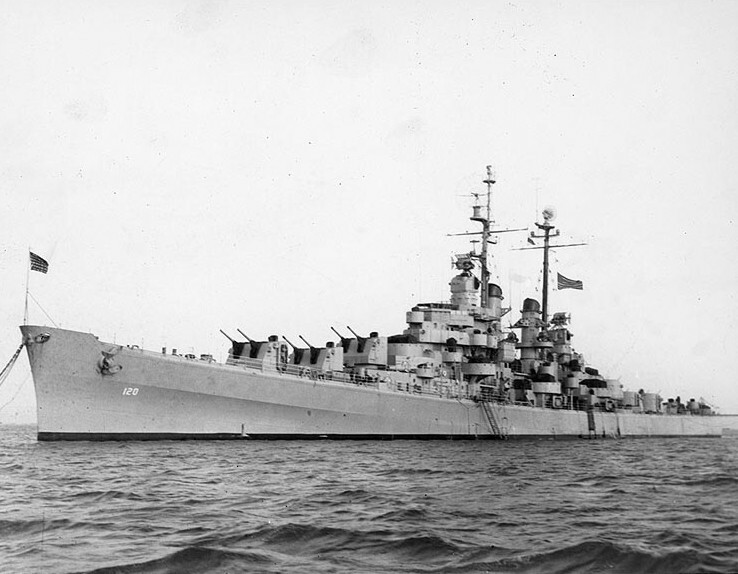 The ship cleared New York on 16 April 1947, and joined the 6th Fleet at Trieste on 2 May where she aided in stabilizing the unresolved question of territorial ownership between Italy and Yugoslavia. During an extended tour of Greece, she provided ample warning to the communists that aggression would not go unchallenged. 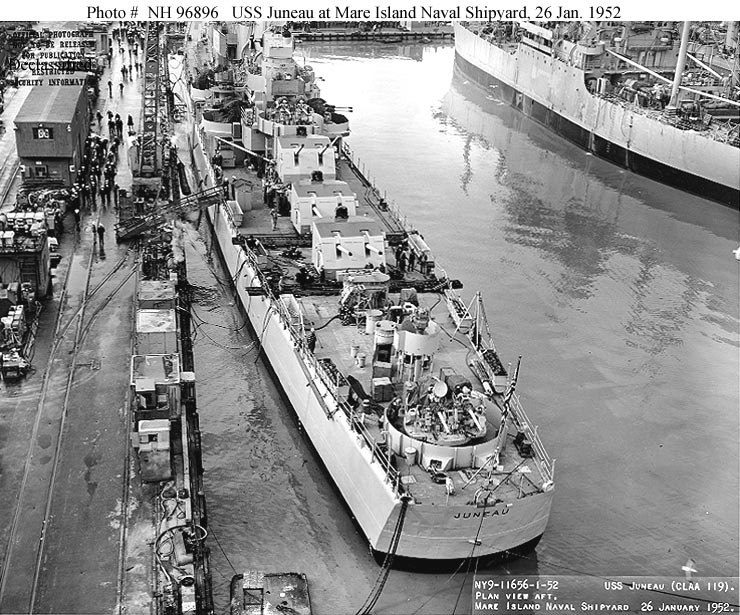 The ship returned to Norfolk on 15 November for training, and was back on duty with the 6th Fleet from 14 June-3 October 1948 and again from 3 May-26 September 1949.
modernization at Mare Island on 2 Nov 1951. 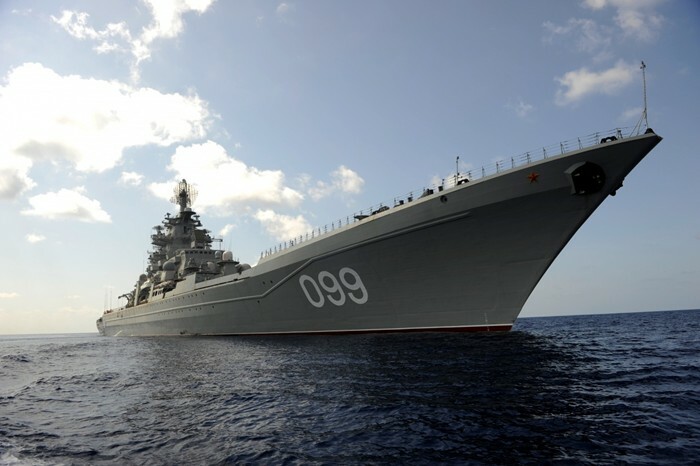 She is still equipped with 40mm gun mounts. 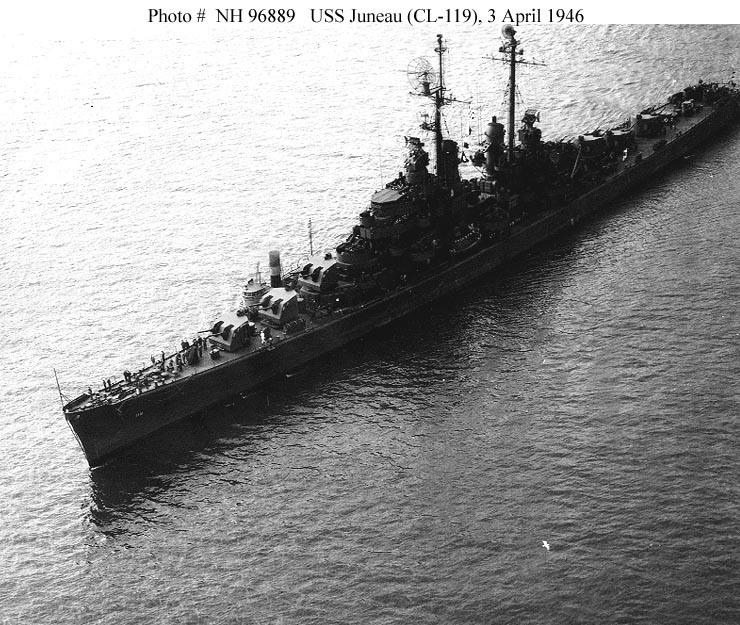 USS Juneau (II) was reclassified as CL-119 on 18 March 1949, similarly to the rest of the Atlantas. The period 1951-1952, the ship was overhauled at Mare Island and received among others the new 3”/50cal twin Mk.22 mounts, which replaced both 40mm and 20mm AA weapons. 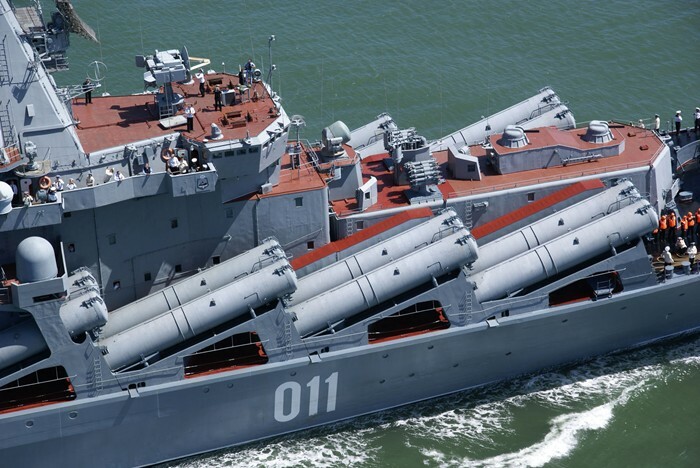 The new configuration included seven 3”/50 Mk 33 twins, plus Mk.56 3-inch gun directors amidships, plus new Mk.37 gun directors (Mk.25 radar dish configuration) replacing earlier Mk.12 and Mk.22 atop the 5” mounts. 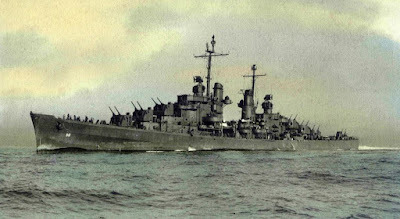 The 3”/50 twins were design to defeat the kamikaze threat late in the war, where the 20mm and 40mm shells had proved often unable to bring down an aircraft, and the 3” also had VT fuzes. 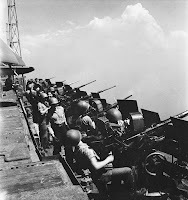 Fulfilling a role to engage enemy aircraft out to 7-miles, the range is generally reported at 14,600-yards and the rate of fire per cannon was around 50 rds/min. Mount training rate was 24-deg. per second, offering rapid enough engagement capability even of early-generation jets at low altitude. Two to three hundred rounds were carried in each mounts ready locker storage area, but were still manually loaded to the mount. The full load displacement was increased to 8,678 tons. Photos from the early-1950s show the newly enclosed bridge that replaced earlier Atlantas open bridge configuration, and several other configuration improvements. In was in this configuration that CLAA-119 sailed from Bremerton, Washington on 15 Jan 1950 for Western Pacific duties. 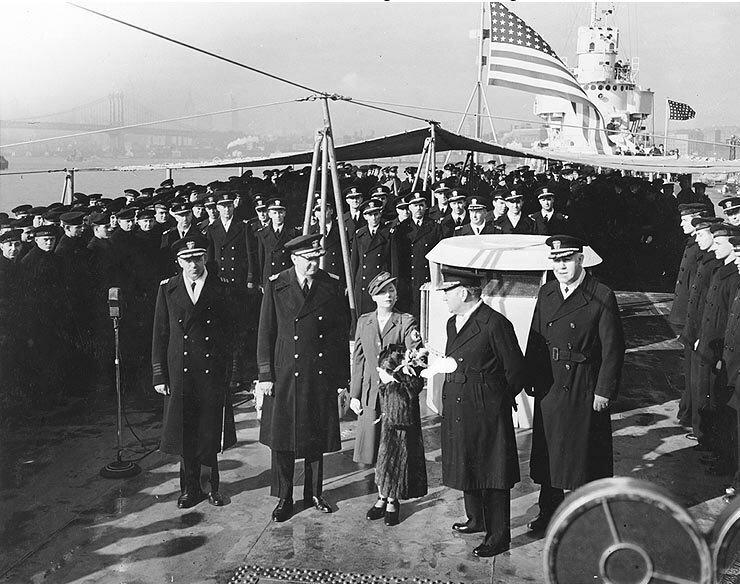 On 22 April, she became flagship for Rear Admiral J. M. Higgins, Commander Cruiser Division 5 (CruDiv 5), and reported for duty in Yokosuka, Japan on 1 June, where she began surveillance patrols in the Tsushima Straits. 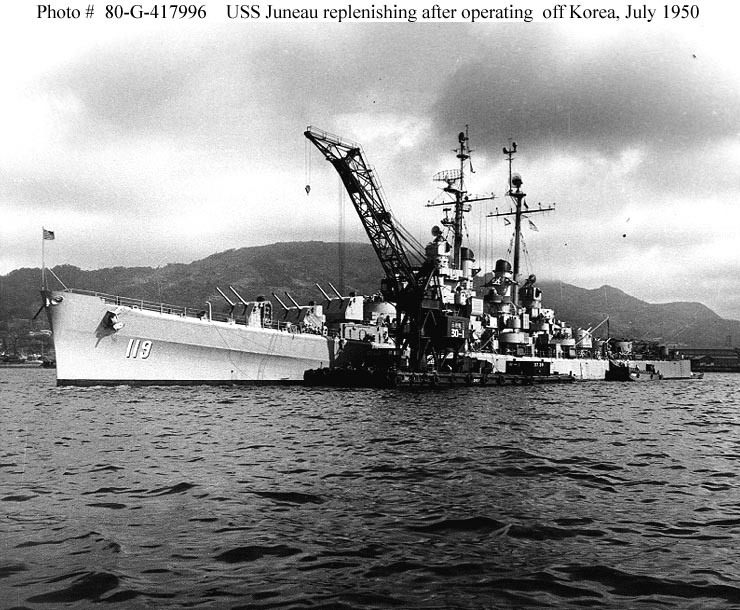 When the Korean War broke out on 25 June, Juneau was one of the few ships immediately available to Vice Admiral C. Turner Joy, Commander of Naval Forces, Far East. She patrolled south of the 38th parallel to prevent enemy landings, conducted the first shore bombardments on 29 June at Bokuko Ko, destroyed enemy shore installations, engaged in the first naval action on 2 July when she sank three enemy torpedo boats near Chumonchin Chan, and supported raiding parties along the coast. 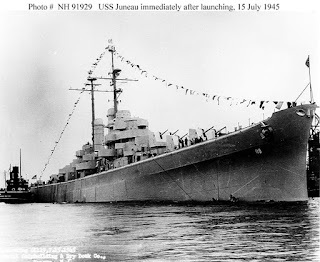 On 18 July, Juneau's force, which included British units such as the Royal Navy light cruiser HMS Belfast, laid down a deadly barrage on enemy troop concentrations near Yongdok which slowed down the North Korean advance southward. 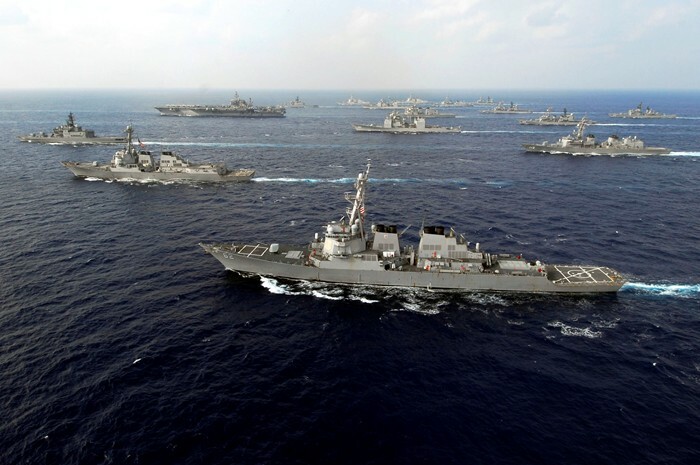 The ship departed Sasebo (Japan) on 28 July and made a sweep through the Formosa Straits before reporting for duty with the 7th Fleet at Buckner Bay, Okinawa on 2 August. She became flagship of the Formosa Patrol Force on 4 August, remaining until 29 October when she joined the Fast Carrier Task Force operating off the east coast of Korea. The ship conducted daily close-in AA protection for the 7th Fleet carriers, and returned to Long Beach, California on 1 May 1951 for overhaul. 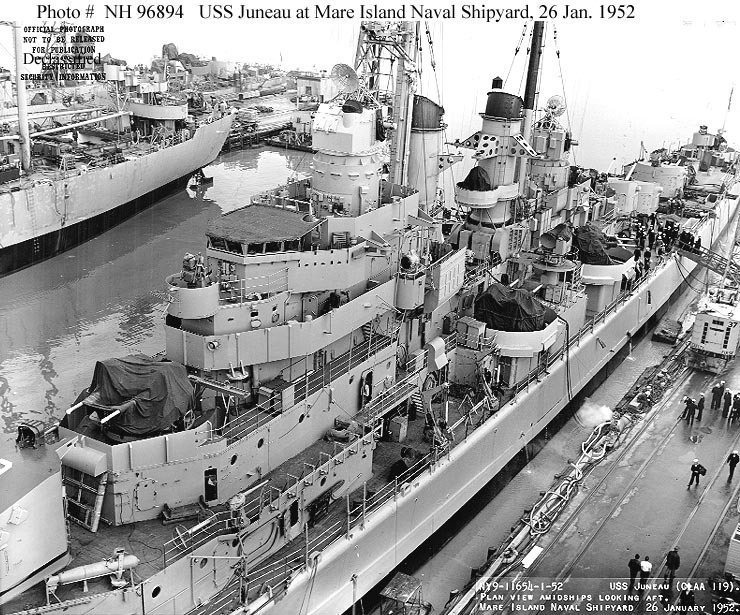 Underway on Jan 26 1952 and a period of operations off the Pacific coast and in Hawaii. CL-119 returned to Yokosuka on 19 April 1952 and conducted strikes along the Korean coast in coordination with carrier planes until returning to Long Beach on 5 November. After a long war off the Korean peninsula, CLAA-119 would return to the Atlantic Fleet, operating out of Norfolk, VA from April 1953. 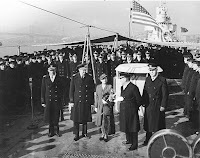 On 13 May the cruiser departed for duty with the 6th Fleet once again, and returned home on 23 October. 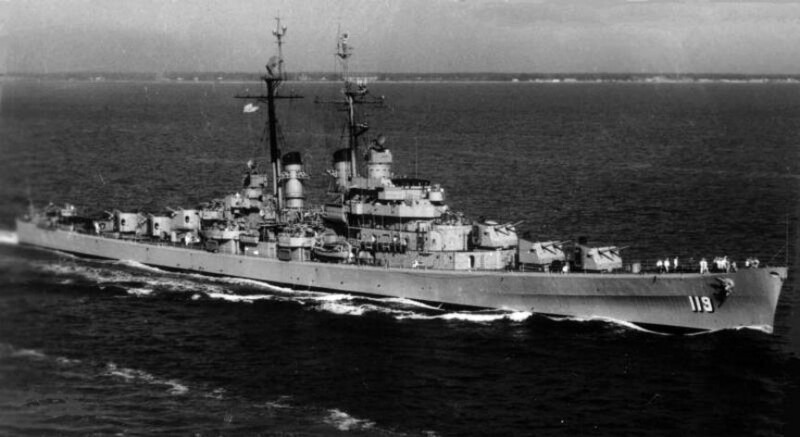 She operated in the Atlantic and Caribbean until 18 November 1954, and then returned to the Mediterranean for her last tour of duty. 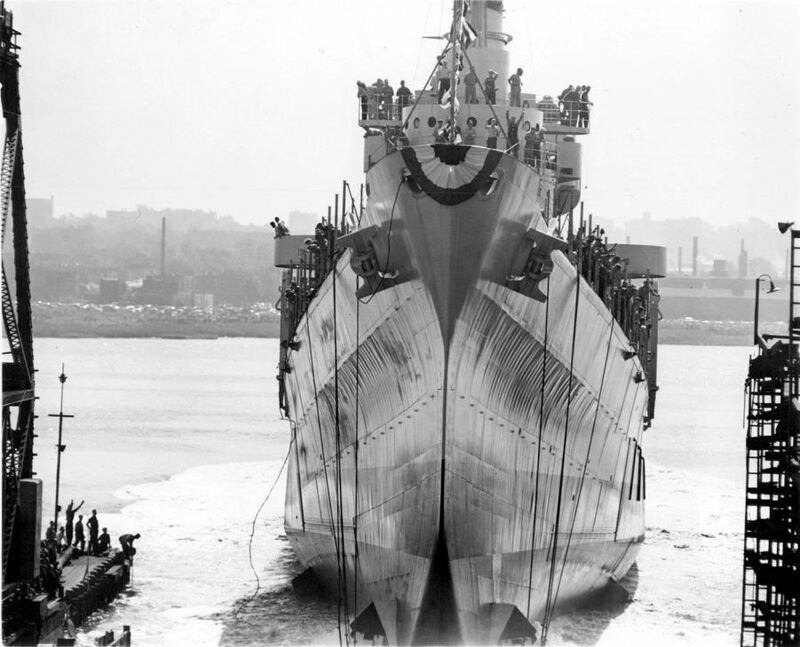 After her return to the East Coast on 23 February 1955, she was placed in reserve at Philadelphia on 23 March 1955, and remained inactive until decommissioned on 23 July 1955, shortly after the Korean War ended. 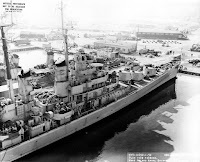 She was attached then to the Philadelphia Group of the Atlantic Reserve Fleet until 1 November 1959, when she was struck from the Naval Vessel Register. 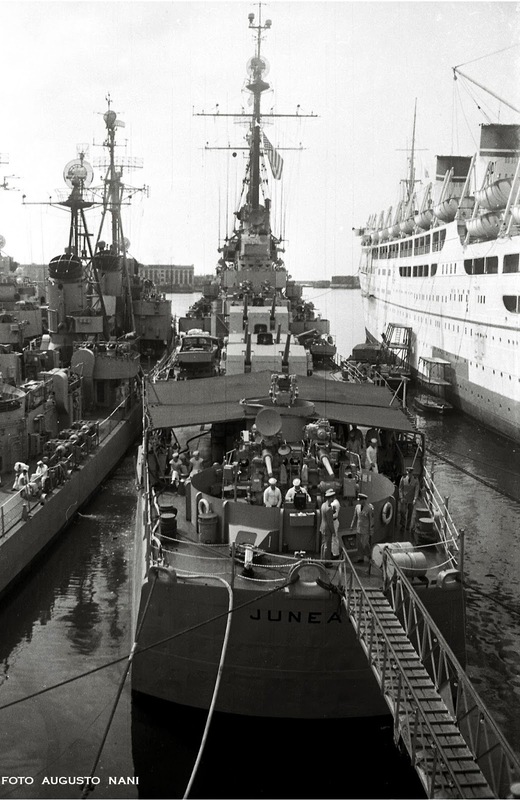 Juneau was sold for scrapping to the Union Minerals and Alloys Corporation, New York in 1962. 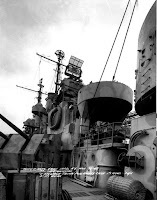 Dictionary of American Naval Fighting Ships, Vol. III, pp. 576-77. INCHON to WONSON, From the Deck of a Destroyer in the Korea War, James Edwin Alexander (1996). The Sea War in Korea, Malolm W. Cagle & Frank A. Mason (1957); Chapter: “The Seaborne Artillery”, p. 281 - 292. 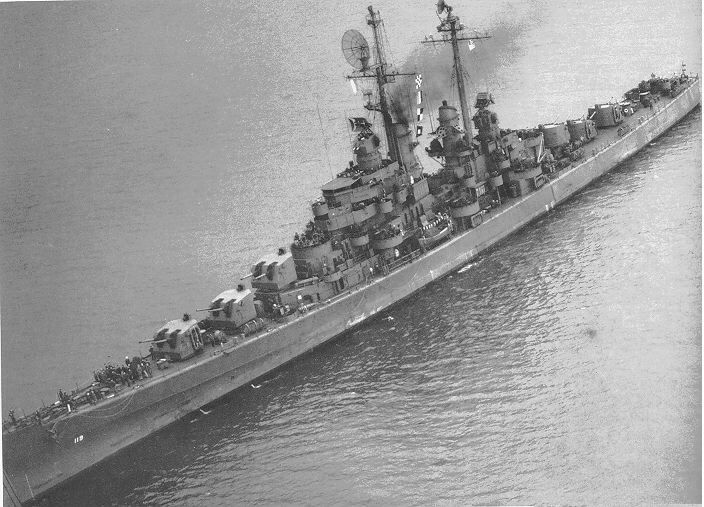 The second USS Juneau was considered more effective in the AA role than the much larger Worchester class. The Royal Navy modernised an equivalent cruiser the HMS Royalist which reentered service with the RNZN in 1956. The Royalist 2 channel 275 MK 6 fire control for its main 5.25 turrets and 3 HADCT built into Mk 2 STAAGs for CIWS incorporate the same Mk 37 and Mk 56 radars as Juneau 1951 modernisation refit, in anglicised form. 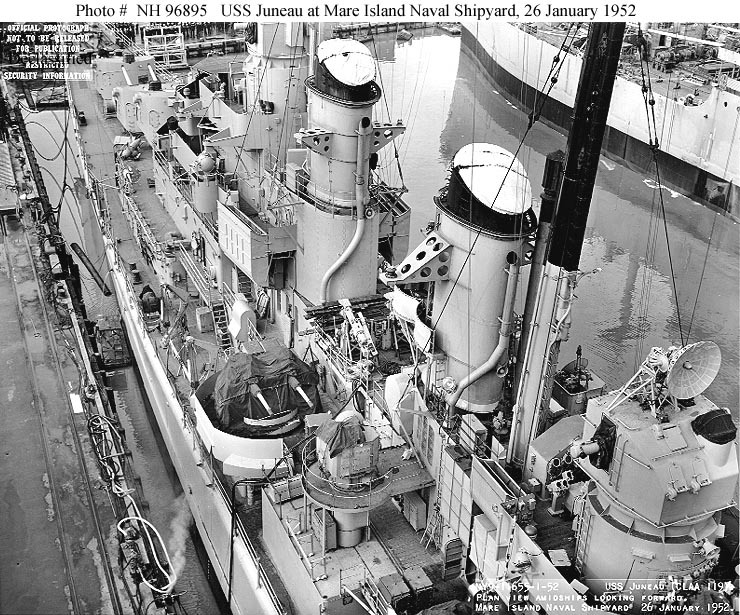 The current RNZN would probably view the Juneau as a vessel much more suitable for New Zealand but the British 5.25 twins are much heavier guns firing 82LB shells and one of the reasons the crew of C119 post war with only the light twin 5 Inch guns as secondary armamement, probably saw the light 5/38 firing Junea as an embarrassment. 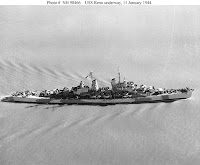 The Royal Navy twin 40min with the fire control seperate or fitted on the mount as in the Royalist was a much more effective system, with 150 rpm from each rifle *300rpm turret than the wartime 40mm quads, and was basically copied by the Soviets for their twin 37mm. 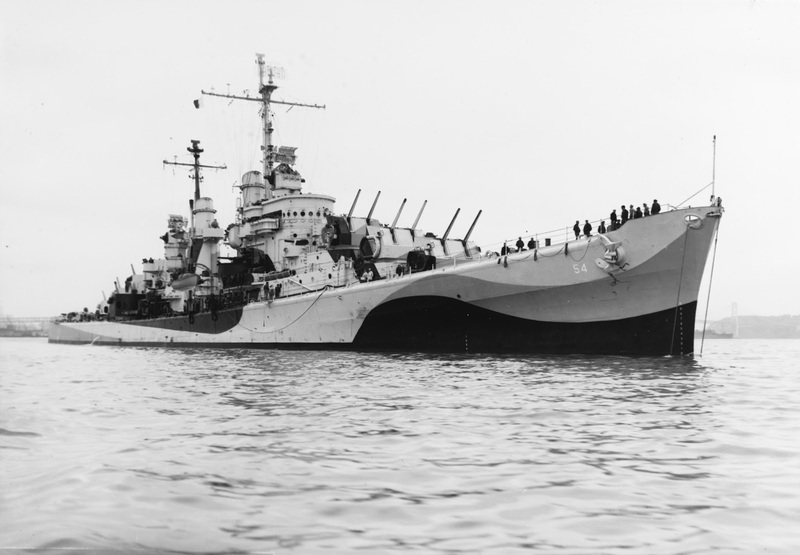 In 1948 the USN considered there new 3 inch 50 guns ten times more effective than the wartime 40mm, but by the 1950s the Britsh twin 40mm was an effective and underated system, although partially maintained because of existing and available ammunition stocks. 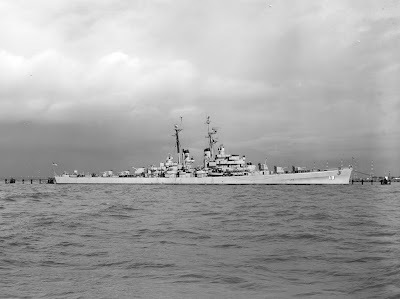 HMNZ Royalist was considered a highly effective AA cruiser on trials and exercises and the work up to the 1956 in which New Zealand and the dual manned RN/ RNZN cruiser were much mor einvolved than officially admissable, and early in its new career the Royalist was considered capable of handling three air targets simultaneously, and likely scoring immediate hits. 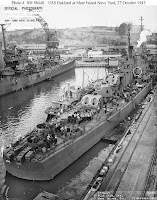 The new technology fitted was at ehe expense of crew accomodation standards reflecting the trade off in small cruiser design. 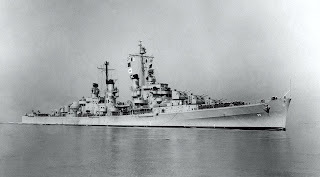 The 1950s really small the end of traditional small cruisers, with the proposed RN cruiser destroyers not proceeded with and the converted Oregon City , the command cruiser, USSS Northampton illustrated that effective modern armament did not look impressive or politicall influenctial 0o a 15,0000 ton hull The Northhampton entered service with 4 single 5 inch 54 calibre turrets and 4 twin 3 inch 70s which in theory would have required all the available magazine space to maintain 25rpm dfire from the 5 inch and 100 rpm from the 3 inch. In some of your statements, I would concur - others I do not. - 1st line: "The second USS Juneau was considered more effective in the AA role than the much larger Worchester class." 1] I know of no studies relating to a comparison of the large "Worchester" and "Atlanta" class light anti-aircraft light cruiser (CLAA). 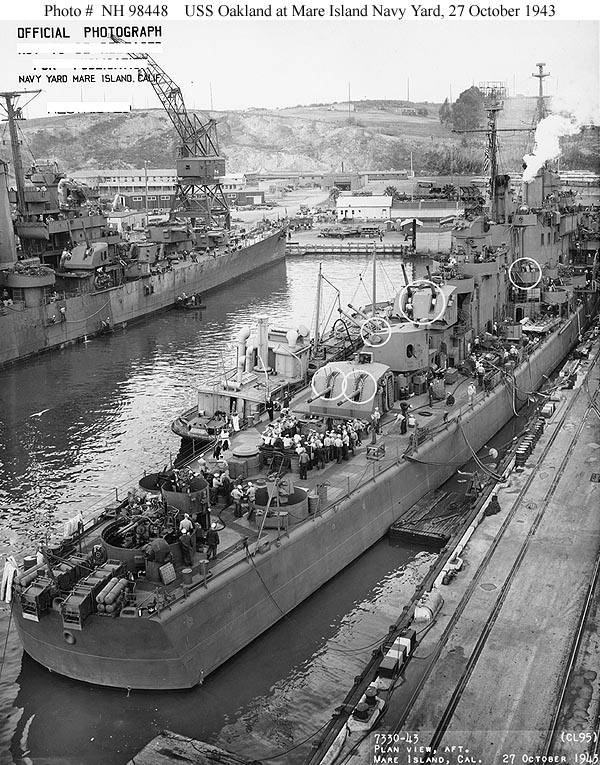 Part of this is probably that Atlanta/San Juan/Juneau II were in service during WW2, and the two large Worcester class were not. 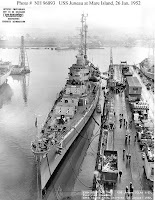 How do you make a valid comparison when one was in service, the other was not, during the period in question (WW2), or limited service in the 1950s, when no anti-air action occurred by either class ship? IF you consider that both CL and CLAA class had the improved 75mm(3")/50 with late-war Mk.56 director, it become a matter that of how many 3"/50 mounts were on each cruiser as a direct comparison method. If numeric numbers is the only criteria, then Worcester CL had the advantage (20x3"/50cal). 2] the US Navy commanders commenting on anti-air comparison between "Atlanta / etal" CLAA and "Cleveland" CL is a more valid comparison. 4. 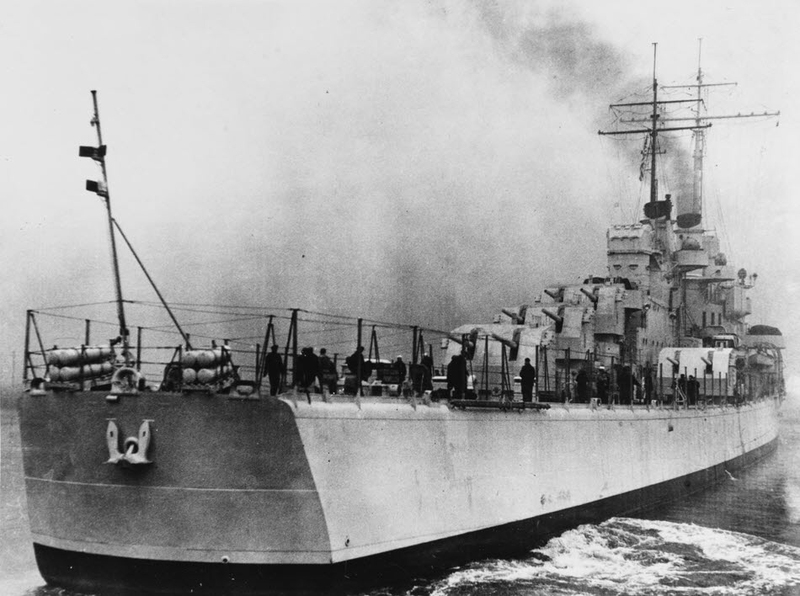 HMNZS Royalist. I have been onboard Royalist, during its final cruise to the U.S. West Coast, prior to its departure for disposal. 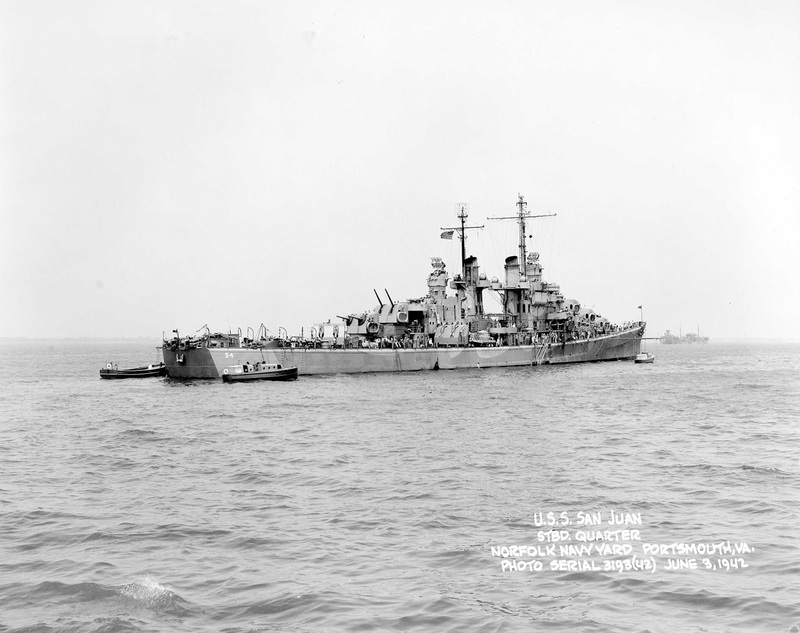 Crewmen admitted their 5.25-in. 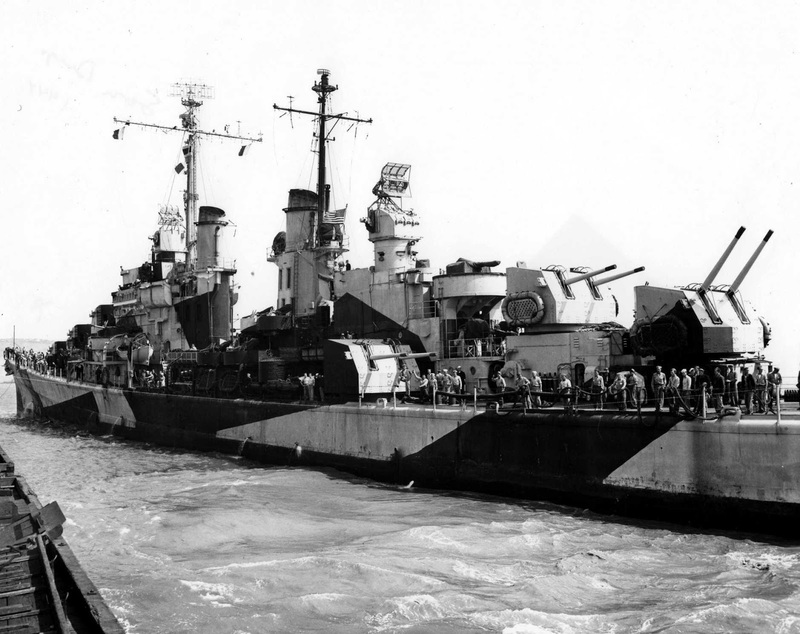 guns, despite having High-Angle DCT, was not comparable in the anti-air role as the USN 127mm (5")/38 with Mk. 37 or Mk. 56/57 FCD,’s. Disagree: [quote]"...and early in its new career the Royalist was considered capable of handling three air targets simultaneously, and likely scoring immediate hits." This is a serious over-statement of the then capability, in the anti-air role of the Mk. 6 FCD w/Type 275 radar, and FPS 5 Flyplane computer system. Contrary to the statement of engaging 3 independent aerial targets, TWO targets only could be engaged with the two GDS 2* direction systems. 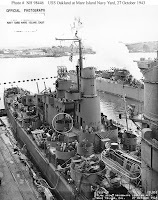 ....the 5.25" turrets were never fitted with Mk.57, later Mk.60, or post-war Mk.56 - a clear advantage of any major US 5" gun turret having these directors during WW2 into the late-1950s. ROYALIST STAAG mount (40-mm Bofors w/Mk.275 radar) could not be used as a close-in FCD for the 5.25's, either. 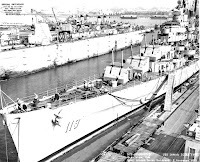 During the war, the Mk.37 so impressed British Admiralty, that is was installed on nearly every Royal Navy combatant that received battle damage overhaul in U.S. shipyards during the war; among the first was HMS Delhi (when rebuilt with 5"/38 Mk.30 single mounts (two Mk.37s installed). the big 152mm(6")/47cal (as well as some Cleveland and the two Fargo class CL's) distant engagement against attack enemy formations before individual aircraft broke those formations....one reason late-Cleveland and Fargo had their 6"/47 mounts elevated to 60-degrees. 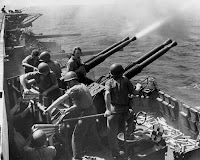 Experience leading to the Okinawa battle, and the anti-kamikaze battle, showed the 40-mm Bofors did not have the engagement range, or hitting power, desire. Thus, the 1945 introduction of semi-automatic, power-driven 3"/50cal Mk.26 (updated Mk.22 with power-drives). 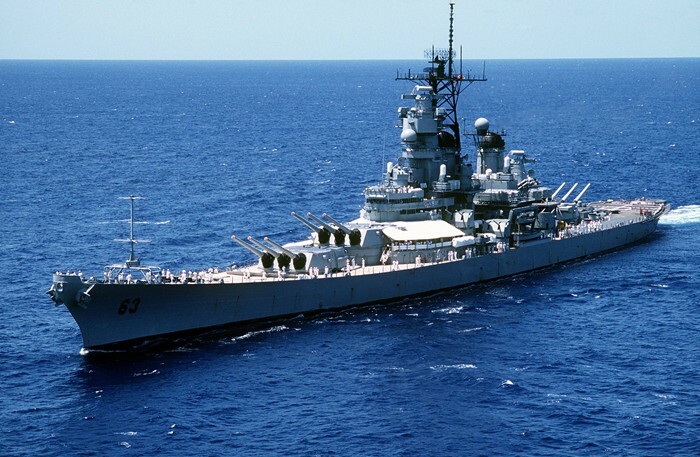 That allowed fitted warships to engage enemy aircraft out to 7-miles, nearly comparable with the 5"/38 mounts.